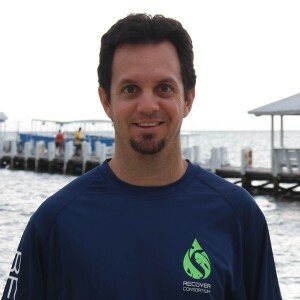 John Stieglitz is a research assistant professor in Marine Ecosystems and Society at RSMAS. His research focuses on aquaculture, physiology, and ecotoxicology. He is investigating the effects of crude oil and chemical dispersants on economically important finfish species of the Gulf of Mexico, using aquaculture to gain insight into acute toxicity and sub-lethal physiological effects of these toxins on different life stages of marine fish. As part of this research, he is working to develop sustainable aquaculture techniques and technology for use in hatcheries and offshore aquaculture sites, with specific focus on high-value pelagic species such as tuna, mahi-mahi, and cobia as well as reef fish species such as red snapper, hogfish, and grouper in an effort to further develop these species for use in marine finfish aquaculture and aquatic toxicology.